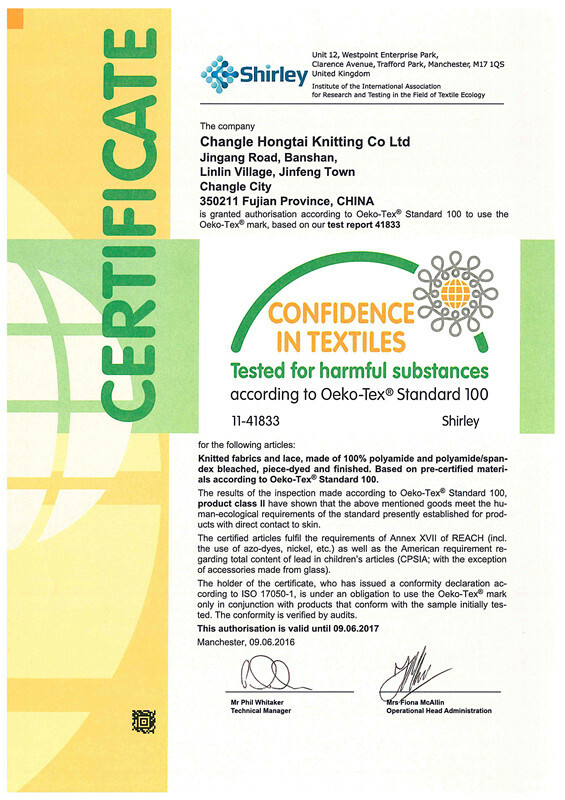 Company Overview - Changle Hongtai Knitting Co., Ltd.
4YRSChangle Hongtai Knitting Co., Ltd.
Changle HongTai Knit Co., Ltd established in 1990. It is a professional manufacturer from Changle city where is famous for lace and fabric. Hongtai is engaged in research, development, production, sale and service over 20years. Because of its quality control and good service, Hongtai earn the reputation from all over the world. 5 years ago, this company introduced the advanced computerized knitting machines from Germany, including RJG5F, MRSS42, MRGSF31/16, MRPJ43/1/24, MRESJF31/1/24, RSJ1/5 and RSE1/4 equipment, which could improve its production capacity to meet the requirement of the market. Its product is very popular in many countries, such as Brazil, Indonesia and Thai .etc. Hongtai is always trying its best to serve all customers.